There are 21 Assisted Living Facilities in the Deland area, with 11 in Deland and 10 nearby. The average cost of assisted living in Deland is $2,739 per month. This is lower than the national median of $3,346. Cheaper nearby regions include Deltona with an average starting cost of $2,400. To help you with your search, browse the 124 reviews below for assisted living facilities in Deland. On average, consumers rate assisted living in Deland 4.3 out of 5 stars. Better rated regions include Orange City with an average rating of 4.3 out of 5 stars. Caring.com has helped 11 families in Deland find high-quality senior care. To speak with one of our Family Advisors about assisted living options and costs in Deland, call (855) 863-8283. Deland is located in Volusia County and is the central business district for Orlando. DeLand has 11 assisted living facilities, with another 12 in nearby communities including Orange City, Debary and Eustis. These facilities are licensed and monitored by the Agency for Health Care Administration. Florida offers Standard licenses and Specialty licenses to assisted living facilities. The three Specialty licenses allow facilities to offer limited nursing services, limited mental health or extended congregate care. Income in Florida is not taxed, allowing seniors to keep all the money they receive from Social Security, retirement funds and pensions. Some items, including groceries and medication, are exempt from sales tax, leaving more funds for your assisted living budget. Public transport in DeLand is provided by Votran, the Volusia County's Public Transit System. Discounted fares are available for people over the age of 65, and all buses are accessible to people with limited mobility. The DeLand area is home to world-class medical facilities, including Florida Hospital, DeLand, in the event of medical emergencies or illness. DeLand has a comfortable climate year-round. The city gets an average of 55 inches of rain each year, which is higher than the national average, but doesn't get any snow. The average high temperature in summer is 92 degrees, and in July the average low is 45. There are 232 sunny days for seniors to enjoy each year. The City of DeLand has many art and cultural attractions for seniors to enjoy. Art lovers will enjoy the Museum of Art and the African American Museum of Art, and some assisted living facilities may offer day trips to visit the DeLand Naval Air Station Museum or to see a performance at the Athens Theater. The overall cost of living in DeLand is 6% lower than the US average, however this is largely due to low housing costs. Seniors will find that groceries and transportation are more expensive than the state average, while health care is slightly cheaper than national averages. Assisted Living costs in Deland start around $2,739 per month on average, while the nationwide average cost of assisted living is $4,000 per month, according to the latest figures from Genworth’s Cost of Care Survey. It’s important to note that assisted living rates in Deland and the surrounding suburbs can vary widely based on factors such as location, the level of care needed, apartment size and the types of amenities offered at each community. 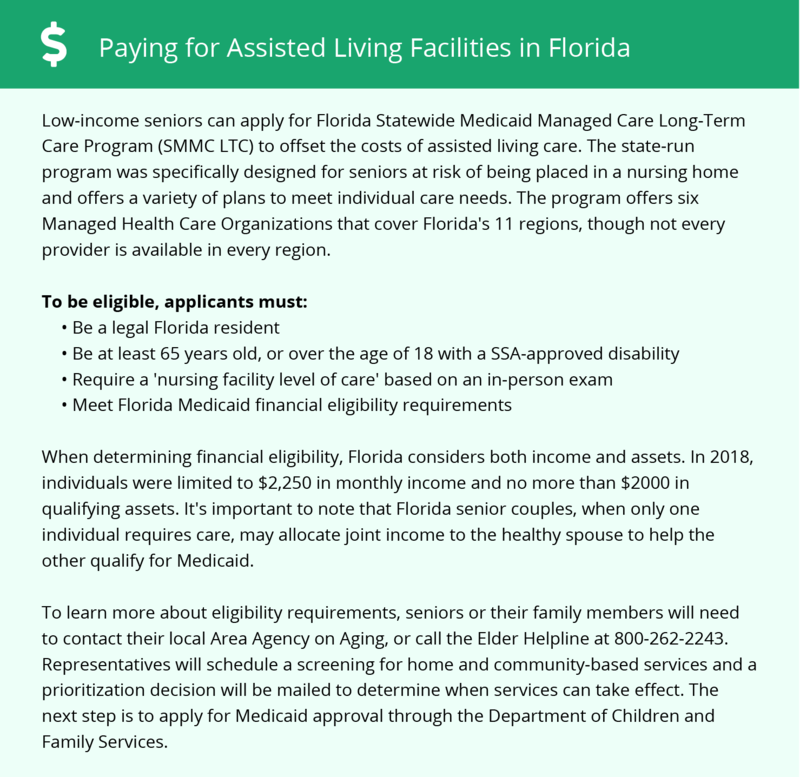 Financial assistance is provided to eligible seniors in DeLand through the Medicaid Long Term Care Program or the Assistive Care Services waiver. The Optional State Supplement may also be available to seniors who receive Social Security income. Deland and the surrounding area are home to numerous government agencies and non-profit organizations offering help for seniors searching for or currently residing in an assisted living community. These organizations can also provide assistance in a number of other eldercare services such as geriatric care management, elder law advice, estate planning, finding home care and health and wellness programs. To see a list of free assisted living resources in Deland, please visit our Assisted Living in Florida page. Deland-area assisted living communities must adhere to the comprehensive set of state laws and regulations that all assisted living communities in Florida are required to follow. Visit our Assisted Living in Florida page for more information about these laws.